We decided on roast lamb for Sunday roast dinner yesterday and boy did it go down well! I loosely based it on a recipe my mum used to make, but this one was too good to forget so I’m going to write it down and share it with everyone else. I’m not going to state specific amounts of ingredients as everyone’s requirements are different, plus cooking isn’t about following instructions it’s about being creative so you can adjust the following to your own taste. I’m also not going say what to have with this recipe, bit I highly recommend some roast potatoes, roast honey carrots and steamed greens with this lamb. By the way, this method (before the cooking stage) is best done the night before, or even a couple days before you intend to eat. This allows the meat to properly soak up the sherry and get so tasty! Home made garlic butter, softened out of the fridge. Cut your rosemary into about 20 x 2″ lengths and set aside. Chop each end off each clove, then take your knife and crush it by placing the side of the knife on top of the clove and using the ball of your hand to apply pressure. You can now easily peal your garlic. Chop your garlic into about 20 pieces (equal amount to your rosemary). With a sharp knife, make 20 deep cuts all over the joint evenly spaced on the top and sides. With your finger stuff the holes with a piece of rosemary and a piece of garlic in each. If there’s any garlic left sprinkle it into the roasting tin. Now, with a teaspoon, coat the meat in an even layer of the garlic butter. Get your sherry and gently pour it all over the joint. Make sure you open the cuts in the meat to allow it to fill the holes with the rosemary and garlic. It should fill the roasting tin about 1.5cm up the bottom of the joint. 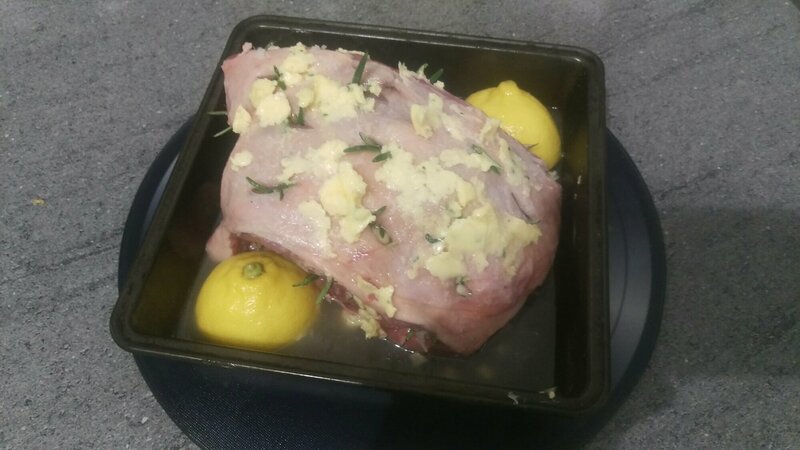 Squeeze each half of the lemon over the joint and place the remains in the roasting tin. Now sprinkle your salt and pepper over the meat to your own taste. Cook the joint as per instructions. In my case 40 minutes per 500 at 180 degrees Celsius,this worked out to 99 minutes. Half way through top up the liquid in the roasting tin with boiling water, this will make excellent gravy! I hope you have a great time cooking this lamb, it was very tasty for us. This entry was posted in Food, Drink & Recipes and tagged Cooking, easy, garlic, lamb, recipe, roast, roast lamb, rosemary. Bookmark the permalink.